Coinciding with the onset of the hottest season of the year, this month is all about that sweltering heat, Kenting beach and brain freeze from the icy summer sips—bubble tea, cocktails and beers. It took everything—and a letter of congratulations from Taiwan’s vice president—for the family of Taiwan’s top female wakeboard to finally climb on board with her career decisions. In many ways and like most sports, wakeboarding is all about perseverance. It’s about getting back out on the waters and mastering that trick despite one crash after another. It’s also about convincing a father who wasn’t keen on the idea of his daughter with a master’s degree in marketing working strenuously outside all day in the sun. Of course, several TV commercial opportunities and major sponsorships from Red Bull and Seidio didn’t hurt. Shannon has travelled all over the world to participate in international tournaments, sponsors funding her favorite sports and works at her dream job in Kaohsiung’s Lotus Wake Park. It all began with a quick decision to join the wakeboarding club for fun while Shannon was a Sports and Recreational Management major at National Taipei University. But it wasn’t until the 2009 World Games held in Kaohsiung that she got serious about the sport. Helping out as a translator and a motorboat rope maneuverer, Shannon got front-row seats to the world’s top riders as they performed their tricks. She began practicing intensely, entering every competition available until she earned the spot as the top rider in Taiwan, keeping at it while other club members graduated and began to quit the sport. 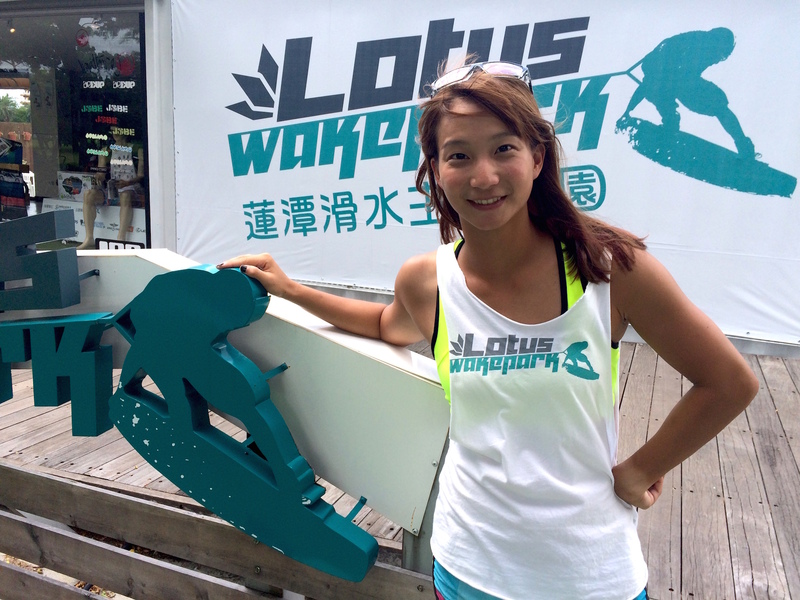 Now 28 years old, Shannon works at the newly established Lotus Wake Park at the Lotus Pond in Kaohsiung’s Zuoying District. The Park features the country’s only five-tower cable system, backdropped by Kaohsiung’s historic Lion and Tiger Pagodas. The Lotus Wake Park even provides a two-tower cable system with slower speeds for the newbies. A 50-year-old man nailed the kneeboards on his first few tries, and a 30-year-old frequent visitor was doing aerial flips as his routine workout. Among the visitors was Danielle Press, a Miami-native teaching English in Kaohsiung who survived a severe boat accident two years ago and became the first to receive a nerve-graph transplant on her leg that would have been amputated otherwise. 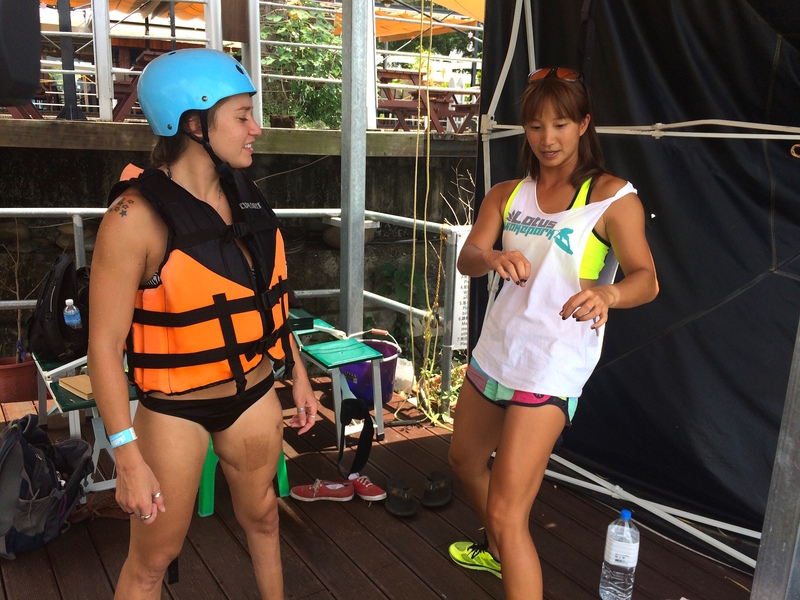 Shannon Teng instructs visitor Danielle Press on how to maneuver a wakeboard. Danielle hasn’t shied away from intense water sports like wakeboarding despite her injuries. Lotus Wake Park makes her feel safe because of the cables, as they remove any dangers from motorboats. Shannon now organizes wakeboarding events and summer camps while instructing old and new visitors in experiencing the thrilling sport at Lotus Wake Park and is among the many enthusiasts trying to get wakeboarding into the Olympic games. 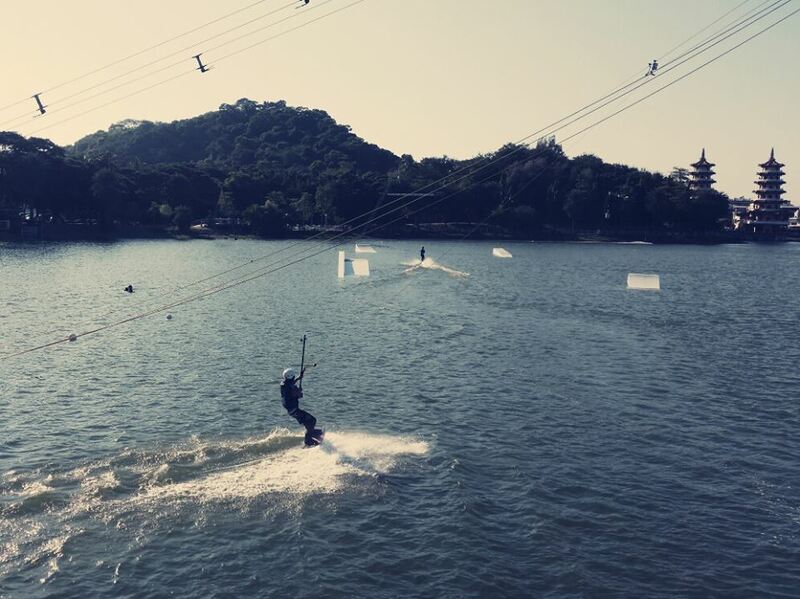 Her other favorite spots to wakeboard include the Weifong River in Taipei’s Luzhou, Kaohsiung’s Lover’s Harbor, and Tainan’s Lakeside Water Bird Park. Shannon says a common misconception about the wakeboarding is that it’s dangerous. However, with careful instruction from patient teachers and a controlled environment, visitors will feel safe to experience the thrill and adrenaline rush. A group of wakeboarding enthusiasts including Shannon have organized the first international tournament of this scale in Taiwan occurring this weekend at Taipei’s Shizi Riverside Park. The event will feature 100 riders from 40 different countries, big parties and free beer.